Business proposals are written for one reason - to win business. In government contracting, you win business when your proposal persuades clients that your solution is superior to your competitors. Download Now for only $19 - Buy Here! You get the reader's attention by stating a specific need or problem and then explain how you can solve this. 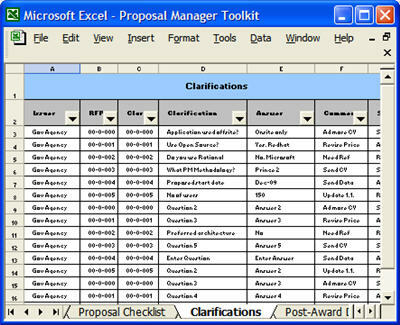 Client-centered proposals show how you understand their need. Show clients that you recognize their need. State it clearly. Show your understanding of the benefits they can expect. (Discuss the solution at a later stage.) Focus on how you can improve their productivity, profitability and success with the solution youre offering. To support your argument, explain the consequences of inaction or selecting inferior products. You'll establish credibility not so much by demonstrating your expertise, but by showing your understanding of their business needs. Make a firm, clear recommendation accompanied by action steps. Avoid vague statements. Make sure that the reader understands what you are proposing. Ask yourself - can they summarize in one sentence what you are proposing. "We recommend that the <Client> use your company to design, write and produce its corporate marketing brochure." Give the reader technical and other supporting details that highlight your qualifications and competence to deliver the solution on time, on budget and to specification. Demonstrate your credibility and ability to provide such a solution. Discuss the issues, costs, schedules, risks, future implications. Always return to your key selling point and how your recommendations are presented in terms of a quantifiable benefit. Give convincing reasons that the client should choose you over all others.